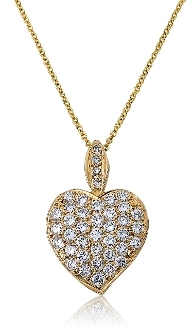 With a touch of glamour and sparkling with style, this 14 Karat yellow gold pave Diamond heart pendant becomes a look of unmatched beauty. In jaw-dropping elegance, 1.85 Carat t.w. of natural white Diamonds shimmer with fire and radiance, The 14 Karat gold setting provides just the right contrast to bring out all the luster and sparkle of the sweet heart pattern that draws the eye, while flickering white Diamonds embellish the romantic design. Boasting just under 2 carats of dazzling Diamonds, complete with a pave Diamond bail, and bright polished finish, this pendant is certain to delight. This gorgeous piece comes complete with a 16 inch chain that secures with a lobster claw clasp.